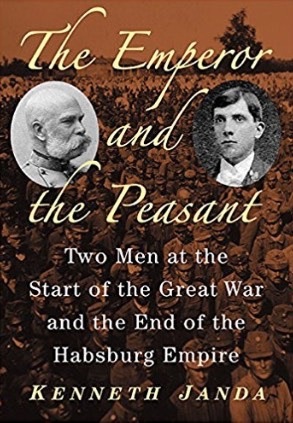 The Emperor and the Peasant: Two Men at the Start of the Great War and the End of the Habsburg Empire.. Jefferson. NC: McFarland and Company, 2018. Tells parallel stories about two men at opposite ends of the socal scale living in separate societies in the same country at the same time. The country was the Austro-Hungarian Empire. The time was over 100 years ago, at the end of the 19th and the begnning of the 20th centuries. The empreror was Franz Joseph I of Austria-Hungary. The peasant was my wife's grandfather, Samuel Mozolak, who lived in a Slovak village in Hungary, one-half of the empire. The emperor's story is told in the odd-numberd chapters; the peasant's in the even-numbered ones. "More Slovaks in the U.S. Than Czechs? Who Says? When and Where?,"
"Slovak Peasants in Hungry Prior to World War I,"
Nasa rodina,29 (September, 2017), 114-119.
in Nasa rodina, 28 (September, 2016), 125-128. "World War I Treaties: Joys and Tears,"
"More Slovaks in the U.S. Than Czechs? Who Says? When and Where?" Prepared for delivery at the 28th World Congress of teh Czechoslovak Society of Arts & Sciences; Bratislava, Slovakia, September 1-4, 2016.